Transferring extremely aggressive chemicals presents tough challenges for pumps, where despite the risks, a safe, reliable and accurate pumping performance is essential. A good example of where such a pumping performance has been achieved is with LIQUIFLO magnetically coupled gear pumps supplied by Michael Smith Engineers. The application is at a leading UK manufacturer of industrial chemicals including surfactants and personal care products. The pumps were installed in 1996 and are still in service today, more than 20 years later. The requirement was for three pumps to batch transfer a range of acidic and chloride based chemicals on a daily basis, operating up to five days a week. The nature of the application means that transfer rates are variable but in the region of 700 kg/hr at around 3.5 bars differential pressure. Due to the extremely aggressive nature of the chemicals being handled, the pumps selected were manufactured in Hastelloy C276. Also, because of the low viscosity of the product a Hastelloy drive gear with Ryton idler was specified to eliminate galling of the gears through lack of lubrication. The shafts were also Hastelloy running in Teflon bushings. The proven performance over such a long period of time on this type of demanding pumping application is testimony to the durability of Liquiflo pumps. 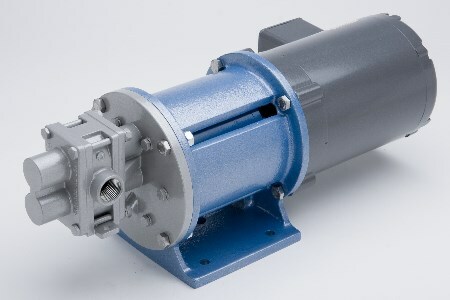 As external gear pumps they are designed for delivering smooth and accurate pulseless flows, while a magnet drive ensures zero leakages and eliminates the need (and associated maintenance costs) related to replacing dynamic seals. The Hastelloy C construction provides optimum corrosion resistance, harder wearing and extended pump life while a compact, close coupled design results in a reduced footprint freeing up workspace. The H Series pumps feature larger diameter shafts and bigger bearings than other pumps with similar capacities and this allows them to handle higher pressures and operate for longer between servicing. These high pressure gear pumps are available in packed, mechanically sealed and leak-free magnet drive versions. The range consists of 12 models and covers flows up to 180 l/min. and differential pressures up to 15.5 bar.